Al-Araibi's wife also begged for his release in an open letter to Thai Prime Minister Prayut Chan-o-cha, saying her husband would face "imprisonment, torture and possible death" if sent back to Bahrain. He was seen talking happily as he walked past the gate to board his plane. 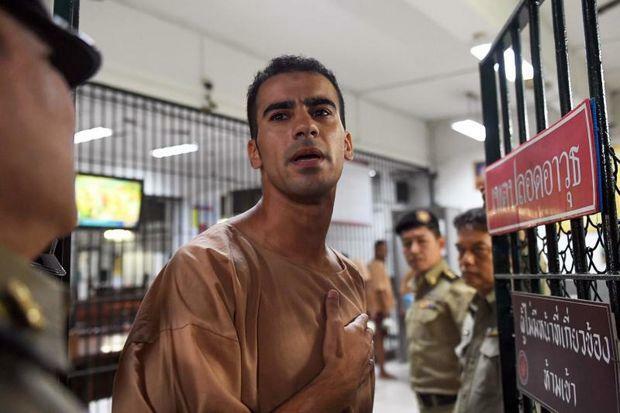 Bahraini footballer Hakeem al-Araibi, who was facing an extradition trial in Bangkok since his detention in November past year, was heading back to Australia last night after the Bahraini authorities chose to withdraw their extradition request. It was not immediately clear when or why Bahrain withdrew its request. The young footballer has said he was playing in a televised match around the time of the crime and could never have been there. Bahrain claimed in its extradition request that al-Araibi faced a series of criminal charges reportedly during an uprising, including arson, illegal gathering and assaults, as well as possessing firearms and explosives. Former Australian football captain Craig Foster who has been leading a protest in the football community for Araibi's freedom expressed his "deepest gratitude" for the news. Morrison said: "Now the next step is for him to return home". He has been living in Melbourne, where he plays for a semi-professional team. The Thai Foreign Ministry later declined to give details of why Bahrain asked for the case to be dropped. "We greatly respect the process that they have had to work through and we greatly appreciate their listening to the issues that have been raised by our government and many others who have raised this case". They were visiting Bangkok for a honeymoon trip on November 27 when al-Araibi was arrested following an Interpol red notice initiated and then later cancelled by the Australian Interpol police.